The Utaka of the Copadichromis mbenjii group by Ad Konings. A comprehensive look at these striking dwellers of the intermediate habitat. 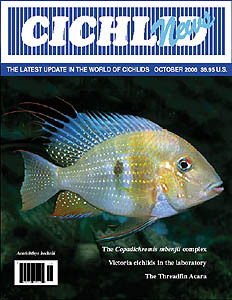 Keeping and Breeding Lake Victoria Cichlids in the Laboratoryby Patrick Niemantsverdriet. Thirty years of study and species maintenance in the Netherlands. Conceived in the Substrate – Acarichthys heckelii (Mueller & Troschel 1848) by Radek Bednarczuk. The burrowing, warmth-loving, Threadfin Acara. My Favorite 6 Cichlids – Juan Miguel Artigas Azas takes on the impossible task of narrowing down his favorites to a list of six.